Producers of quality wines, who can’t help but be the staunchest local patriots, assert that the local “terroir” provides the best wine. But if we put trust in the loose translation of “a sense of place”, dressed with a solid aroma of ancient legends, a squeeze of mystique, and a touch of enigma – the “place” would naturally be in Northwestern Bulgaria. Here production of the best wine is an age-old tradition, which professionals nowadays recreate successfully, offering the tourists some of the best enotourism destinations. The soils, favorable climate, and mastery of winemakers in the Northwest are some of the unique prerequisites for growing truly good grapes and for producing quality wine for connoisseurs. According to specialists, there are still many uncharted micro areas in Northwestern Bulgaria, which have promising potential to one day become a “terroir” of new, enchanting series of Bulgarian wine. A part of the Magurata cave – the Bat Gallery – was transformed into a place for aging of selected wines decades ago. 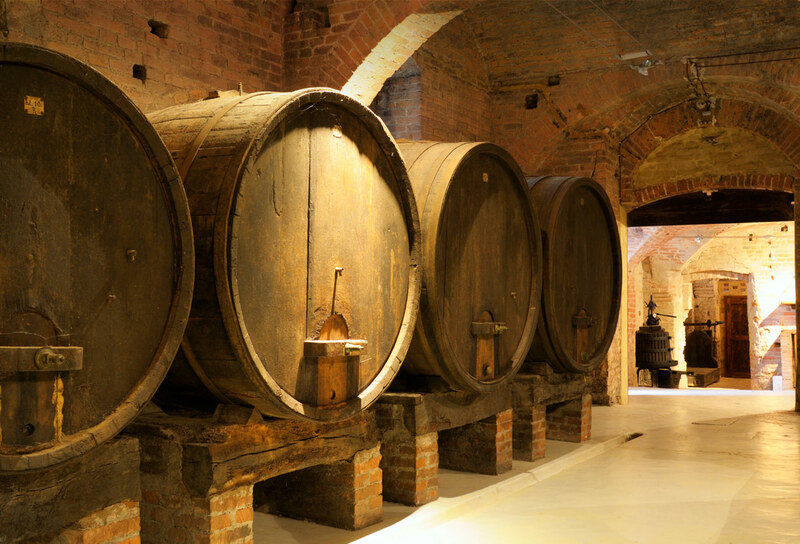 The wine cellar is furnished with state-of-the-art equipment for winemaking. Specialists have discovered that in terms of soil- and climate conditions the area around the Rabisha mound comes close to the French region of Champagne and some of the best Bulgarian naturally sparkling wine is produced here using traditional technology. Wine is stored and slowly ages in the cave’s deeper underground. The stable temperature of 12C, the darkness and permanent air moisture create the conditions for natural champagne-fermentation – under a traditional bottling technology, with a three-year maturing. The winery has 36 hectares of owned vineyards, from which it produces over 200 000 bottles of environmentally clean wine per year. It is located in the Georgi Damyanovo village and is the successor of the winery built in the now-distant 1936. During the 1960’s the winemakers called for help the miners of Chiprovtsi, who carved a 47.5 meter long and 4.5 meter wide tunnel into the cellar’s rocks. Thus, more than 100 wines are stored and matured at the winery at a year-round temperature of 12°C. In order to properly store the high-grade wines ventilation has been installed, with permanent humidity levels being maintained. The Borovitsa winery is nestled among the Belogradchik Rocks, near its namesake village. The winery produces limited consignments of wine, which have both won over connoisseurs and garnered many awards. Some of Borovitsa winery’s vineyards are situated beneath the Belogradchik Rocks and grow on the unique sandy-rocky soil. The winery produces some 25 varieties of unique wines. “The logic that each vineyard, each massif is a different terroir conveys the philosophy of the Borovitsa winemakers, who wittily named their winery – probably either after the grandmother, looking after a vineyard, since her children are in the big city (she puts in this work the huge enthusiasm it would otherwise have devoted to her grandchildren) or after Enrique Iglesias. Each wine truly comes along with its character and although some are very similar, others display huge differences. You wouldn’t understand me without tasting (for example) the merlot of the Les Amis series and that of the Great Terroirs series bearing the name of Pepper Garden. Each such bottle-trapped spirit comes in limited series of 250 to 400 bottles”, says Ilia Markov on vinoblog, having tasted the unique wines of the enologists Adriana Srebrinova and Ognyan Tsvetanov. The wines are produced with minimal technological interference, with no sulfites added to the red wines and very little sulfites added to the white ones. One can refer to the Borovitsa Winery as a “craftsman produces”. “I believe that the masterful making of such distinctive wines is a philosophy and style of living, rather than a business,” says Ognyan Tsvetanov, the winery’s owner. The Macedonians call this variety Cetereska, the Hungarians – Kadarka, whereas in the Vidin region some elderly people still call it “black giza”. The Gamza grape variety is found in several places in Europe but it grows best in our Northwest. The grapes ripen late – in the latter half of September. In late fall small cracks appear on the grapes, with solid grape juice coming forth under the thin, dark-blue skin – this is picking time so as to turn it into the most full and fragrant wine – the Gamza. Nowadays, this variety, which is traditional for the Northwest, experiences revival, winning over more and more admirers. It is known as a “demanding” variety – it not only requires certain locations and climate, but also extensive care in the vine growing. Vidinska Gamza is one of the largest producers – it is a winery set up by owners of more than 600 decares of vineyards in Novo Selo, Vidin district. Chateau de Val was established in 1998 by Val Markov with the intention of restoring the Vidin region’s tradition and reviving the long-forgotten high-quality, unique wine. Chateau de Val produces high-grade natural red and white wines. Chateau de Val’s pride is called GRAND CLARET – red blended wine. Chateau de Val also produces Cabernet Sauvignon, Merlot, Free-run wine, Syrah, Cabernet Franc, Chardonnay, Sauvignon Blanc, Cuvee Riesling, Viognier, All of our wines are produced in the traditional style (natural production of grapes), mandatorily fermented and aged in American, French, and Bulgarian oak casks. Chateau de Val’s wines are highly appreciated worldwide and have received numerous awards at a number of competitions. The Chateau de Val winery is located 3 km outside the Gradets village, which is 12 km to the northwest of the city of Vidin, in the Topolovets river valley. The first written records of this settlement (then called Urumlar) date back to the 15th century. It later became known as Gartsi and obtained its present name Gradets in 1934. It reached its peak in 1956 when it had 4000 inhabitants. The first church in the village – St. Prophet Elijah – was built in 1854. Some three decades later it was torn down and in 1896 construction of the current, namesake church was completed. The Albotin Rock Monastery is located 8 km west of Gradets. The vine massif of Chateau Burgozone, located on an area of 100 hectares, is perched on an unique terroir for grape growing, on the steep slope of Danube’s southern shore, near the town of Oryahovo, Bulgaria. It rises 130 to 180 meters above sea level, its geographical coordinates being 24° eastern longitude and 43,43° northern latitude. The winery is of the chateau type, since it is located within the very vineyards. From a winemaking perspective this is a definite advantage as the timely grape processing, done immediately after picking, does not allow any change in its characteristics and composition. The building itself, being an original architectural combination of a cellar and a boutique hotel, is designed and built above the Danube river’s steep southern slope, the cellar premises storing the wine at optimal temperature being situated on two levels underground. There used to be remnants of the ancient Roman fortress of Burgozone within the vine massif, thus rendering its name to the grape growing-winemaking facility. Numerous parts of ceramic vessels, which were dug up and found during the planting and growing of the vineyards can now be seen at the local history museum. The fortress was situated on the ancient road connecting Belgrade with Constantinople and protected the Roman Empire from the raids of Transdanubian barbarians. Material evidence in the shape of earthen jars and other ceramic vessels used for grape growing and winemaking also dates back to the same period.